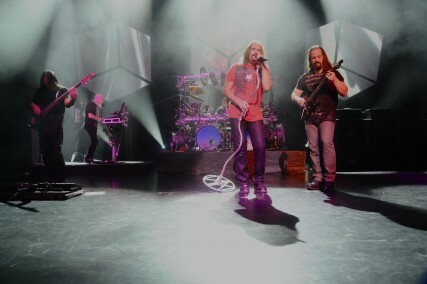 Dream Theater played the Artpark Mainstage Sunday evening to a desolate but boisterous crowd. Do not let the crowd size fool you as what they lacked in size they made up for it in voice. This show marked the first Buffalo area appearancefor Dream Theater since the departure of founding drummer Mike Portnoy. The position, now manned by Mike Mangini who like his predecessor, also comes with a fully stocked drum kit. The remaining core members include James LaBrie on vocals, Jordan Rudess on keyboards, John Myung on bass and John Petrucci on guitar. The evening started off with “Bridges In The Sky” a cut from the band’s latest release A Dramatic Turn Of Events, their eleventh studio album and their first without Portnoy. The band managed to sprinkle the new songs throughout the set as well as adding “A Fortune In Lies”, a tune from their very first When Dream And Day Unite. Some of the highlights included “The Spirit Carries On”, ”Surrounded” and the encore of “Metropolis Part 1: The Miracle and the Sleeper”, the latter two from their breakthrough album, 1992s Images and Words. The band appeared to be in top form already as this show was only their second full one on this leg of dates, having opened the tour down the road in Rochester. They have won numerous awards and had several distinctions bestowed upon them. The musicianship in this band is impeccable to say the least. To truly appreciate how good these guys are, one must see them live at least once, which should keep you coming back for more. Special Thanks to Amy Sciarretto from Roadrunner Records!